The 2013 Colorado Bike MS is less than two months away. As a part of my Bake MS Campaign, I promise to make treats for friends who donate to my ride. These treats are for my friend JP. She suggested that I could make her store bought slice/bake chocolate chip cookies or I could make her a coconut cream pie. 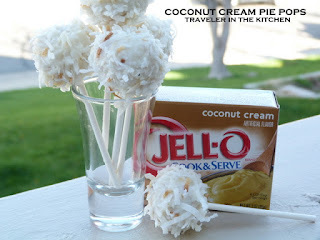 These are portable coconut cream pops that are good to go. 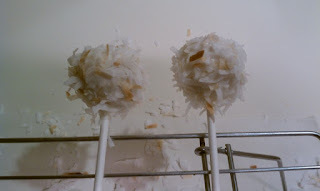 Cake pops are not as intimidating as they look - but they do take a little time. You can do it! You're going to bake a cake (whee!). Follow the instructions on your box of yellow cake mix. Add 1/2 teaspoon coconut extract to the other ingredients your particular mix calls for. You're going to follow the directions for the 13x9 pan. Enjoy the fact that your cake doesn't have to be beautiful. You're going to be tearing it up. While your cake is baking, prepare the pudding according to the package directions. You're going to let both the cake and pudding cool before you start making your cake/pie pop filling. While the cake and pudding are cooling, go ahead and toast your coconut. The key thing is to watch it like a hawk. It goes from toasty goodness to something not as attractive in the blink of an eye. Line a baking sheet with a silicone bake mat (or parchment paper) and spread out the coconut so it is as close to one layer as tiny shreds of coconut can be. Preheat your oven to 350 (it may already be there from baking the cake). Set your timer for 3-5 minutes to toast the coconut. The coconut around the edges will turn brown first - when that happens, take the coconut out and put it in a bowl (cereal size is fine). When the cake and pudding have cooled, it's time to tear it up. 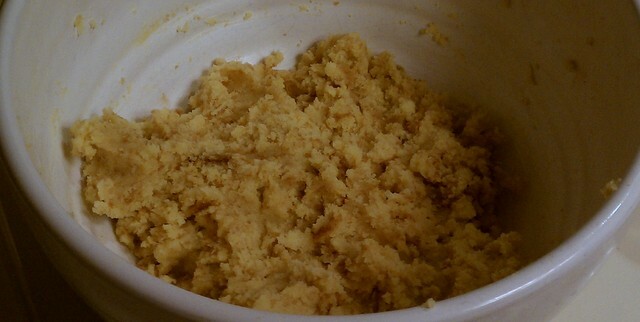 Use your hands, or a spatula, and break the cake up and dump it in a large mixing bowl. Crumble it up. Add one cup of the prepared coconut pudding and mix (with your hands or a spoon). Roll the cake/pudding mixture into balls, about the size of a ping-pong ball. To make them easier to work with after I roll them and put the stick in, I put them in the freezer for at least 15 minutes. Once you have chilled pops ready to go it's time to melt the candy coating in the microwave. Similar to the coconut, start slow and watch it constantly. Use a smaller microwave safe bowl (again a cereal bowl is fine). Microwave the candy on low and stop every 30 seconds to stir. When most of the chunks have melted, stop microwaving and just stir the candy until it is smooth. You don't have to do large quantities of candy at a time. 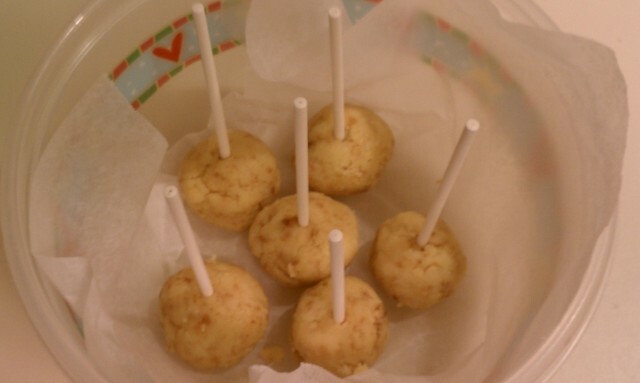 Dip your cake pops in the candy coating. You may need to use a spoon to make sure the coating covers the entire pop. Because the cake is cool from the freezer, the candy coating will harden pretty quickly, so don't delay. 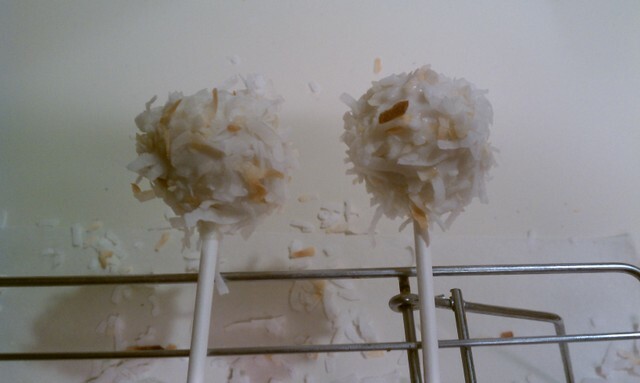 After you dip the pop and allow the extra candy coating to drip off, roll in the coconut. Make sure coconut gets on the top. You can also use your hands to pat the coconut on. Unless you have lots of people around who are willing to hold the cake pops while the coating dries, use a metal cooling rack. You can tuck the sticks into the wires so that the pops aren't resting on one side while they dry. Depending on the size, you'll probably be able to make 25-30 cake pops. Store your cake pops in an air-tight container in the fridge until you're ready to gift them to a friend or serve them to your family. Like cake pops? Try my Strawberry Party Pops! Let's be friends! Like Traveler in the Kitchen on Facebook.